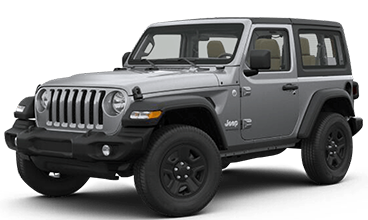 The Jeep Wrangler is a perfect mix between rugged and refined both inside and out. In the interior of the Wrangler, you’ll enjoy ample storage space, quieter interior, and harshness protector. You’ll also get comfort and convenience features including available heated leather-trimmed front seats and an available auto-dimming rearview mirror with integrated LED map lights. The stylish interior has fender flares, iconic seven-slot grille and removable doors and top. You won’t be disappointed with how fun it is to drive! All lease based on 10k miles/year. Tax title, acq, sec, reg, inspection and doc fee additional, must qualify lease conquest inventive, available to current lessees of competitive non-chrysler vehicles. Extra charge may apply at lease end. Must qualify for tier 1 credit. Finance bonus required finance through chrysler capital. 0% finance in lieu of rebate. Requires trade-in of any vehicle to qualify. Subject to program change without notice. All transaction must be complete at time of sale. By submitting you agree to our terms and conditions . $299 documentation fee not included in final price. $20 per $1,000 borrowed. Security deposit not required. Residency restrictions apply. Stock #J18601, D9506, CJ3515 sale ends 4-30-2019.